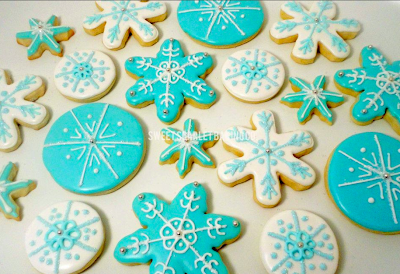 Sweet Scarlet Baking: Let it Snow, Let it Snow, Let it Snow! It is snowing in St. Louis today! My customer wanted decorated sugar cookies for a post Christmas luncheon and I was inspired to create these beautiful snowflake sugar cookies. I thought they would be a great change from all of the Christmas cookies that we all just inhaled. I am so glad that the weather accommodated my theme.